SL Universe is Gone – Sort of… but gone. 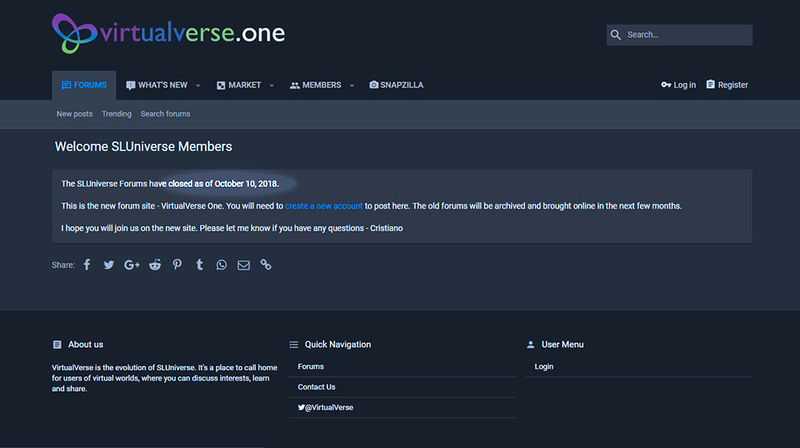 Actually, the SLUniverse forum redirects you to the Virtualverse site as of October 10. You’ll have to open a new account to use the new site. This is the pages showing when an SLUniverse URL is entered. Viewer Blocked – There is an Android viewer named IM to Second Life. As of last Friday, the Lindens have denied that viewer access to Second Life™. Seems there were privacy and security issues. Serious enough ones to cause the Lindens to act. See: Android Viewer “IM to Secondlife” Blocked from Second Life. Second Life Halloween – Premium members get a new gift this month. See New Premium Gift and the Return of the Haunted Halloween Tour. The announcement also points you to scary places in SL. Google Plus Closing – Google+ is in a 10-month sunset period. So, it will last into 2019, about August. Seems there was a security issue. See: Google+ is shutting down for consumers after privacy bug. Columbus Day is No More – Thanks to the left’s fascist-racists teaching Christopher was a white a mass murder. History is well documented and all his contemporaries except for his single political competitor speak well of him. And where did they get the idea he was white? One just has to read historical source documents to be able to recognize the revisionists’ version of history and their an agenda. Google Censorship – The idea of free speech and ideas (unmediated marketplace of ideas) in Europe was given up some time ago in favor of well-ordered safe spaces and civility. Google, Facebook, and Twitter are moving to the European model abandoning the American ideal of free speech. James Damore was fired from Google for ‘insufficient adherence to Google’s ideology’. Speculation is someone involved in the pre-trial legal discovery process leaked the memo. I suspect they chose Breitbart as it is one of the few that one could be sure would print the information. After all Google has already been targeting Breitbart. So… they would be a logical candidate. If you plan to research the subject you’ll need a search engine other than Google. Try DuckDuckGo. Windows 10 Update 1806 Deleting User Files – On no… Those running an early release of update 1806 are reporting the loss of files. Enough have made reports to cause Microsoft to pull the update off line. To see if you have the SCARY update Open Settings -> Update & Security -> View Update History. If it says “Feature update to Windows 10, version 1806”, then you have the problem update. Immediately make a backup. You can find more information online, DuckDuckGo. Google has got nothing as I write this. Seems this isn’t the first Microsoft update to eat files. Magic Leap One Shipping – The new AR Headset is now shipping. It sells for US$2,300… they do offer a 0% interest purchase plan. Still… ouch. See Road to VR’s Magic Leap One Now Shipping Across Contiguous US, Offering 0% Financing. Linden Realms Returns, But Where the #@&! Is Magellan? – Seams the Lab has new adventures out. The most important movie you’ve never heard of: GOSNELL – This movie is out. Read Michelle’s review. Whether Pro ‘Life’ or ‘Choice’ the movie will shock you. Rated PG, I suppose meaning no gore. Released to theaters 10/12/2018. World Makers, MadPea – Drax Files in episode 47 reveals MadPea’s Mad World. It is a fun video to watch. More so than most of Drax’s videos, which I class as significantly interesting… even intriguing, but I don’t think of them as fun. In this one Drax pulls off an excellently played humor. SL Viewer Slow Down – Vir Linden has a post in the SL Forum, Slowdowns in graphics performance? Users of different viewers capable of supporting Animesh are reporting FPS slowdowns. NiranV the programmer behind the Black Dragon Viewer ran into the problem. A few people are exploring the problem and Vir is making changes. To test Vir has a version 6.0.0.520353 available in the thread. It has some mitigating fix he hopes solves the problem. The current Animesh RC viewer is 6.0.0.520211, as I write. So, if you want to help with testing you’ll need to pay attention to versions and include that information with your test results. Plus include info on your hardware. This entry was posted in General Computer Stuff, Interesting, Second Life, Viewers and tagged Google. Bookmark the permalink.